George MacDonald, from a sermon preached at the Christ Church, Addiscombe. Proving the Unseen, chapter 8: "Growth in Grace and Knowledge." We should give ourselves an opportunity to understand humanity, to know those who are about us, and from them to know the individual, until we are a hiding place from the wind, a covert from the tempest, as the shadow of a great rock in a weary land. Every Christian ought to be a refuge. I believe that, if we were like Christ, even the wild beasts of our woods and fields would flee to us for refuge and deliverance. By the title above I do not mean that I am remembering C. S. Lewis. I'm sharing from pp. 42-43 of Walter Hooper's book, C. S. Lewis: A Companion and Guide, which I am slowly reading as I progress in my current project of reading all the books by or about C. S. Lewis that we have in our home library. He had the most astonishing memory of any man I have ever known. In conversation I might have said to him, "I read a marvellous medieval poem this morning, and I particularly liked this line." I would then quote the line. Lewis would usually be able to go on to quote the rest of the page. It was astonishing. Once when I was invited to his rooms after dinner for a glass of beer, he played a game. He directed, "give me a number from one to forty." He acknowledged, "Right. Go to the thirtieth shelf in my library." Then he said, "Give me another number from one to twenty." He continued, "Right. Get the fourteenth book off the shelf. Now let's have a number from one to a hundred." "Now turn to page forty-six! Pick a number from one to twenty-five for the line of the page." "So," he would say, "read me that line." He would always identify it—not only by identifying the book, but he was also usually able to quote the rest of the page. *That C. S. Lewis and the creator of Oh! Calcutta! could sustain to the end a friendship of mutual respect and enjoyment should be an inspiration to us all. For the last Sunday of Advent, a somber note. Sixteen Christmases ago, while the world was singing blithely of joyous birth, we were mourning the death of our first grandchild, whose last breath came but two days after his first. The haunting Coventry Carol spoke to me then as none other. Frankly, I could not handle all the songs about a newborn baby boy; with Coventry Carol I felt merged into an ancient and universal grief. This reminder that the First Christmas was not a facile Peace on Earth and Joy to the World, and that the first Christian martyrs were Jewish children, is for all who mourn this Christmas, especially those who have suffered the loss of a child. Isaac Christopher Daley, I still think of you whenever I hear this carol. Will It Be a Hard Winter? The acorn harvest has been absolutely spectacular this year. The onslaught began in September and even now they continue to fall like hailstones on our roof, our porch, our yard. They fall in buckets, they fall like machine gun fire, they fall like squirrels playing candlepins. It has been four months, and "it doesn't show signs of stopping," to borrow a line from a song about a different form of precipitation. This modern, scientific age insists there's no correlation between the number of acorns produced and the harshness of the coming winter. I'm inclined to agree, given that summer has been very reluctant to let go this year. In honor of the official beginning of winter, forecasters are suggesting that we will experience the low 40's for a few days, but they add that within a week the highs will be back up to 80. Perhaps the abundance of acorns instead presages a winter that will send cooler weather well into the spring, as it did last year, in which case we will be abundantly grateful. Whatever the case, our squirrels will feast this year. As usual, when I make a longish comment on a Facebook meme, I hate to waste it, but use it here as well. This one struck a nerve. but the CDC can pry raw cookie dough out of my cold, dead hands. Amen to that. If a food system is so broken that even flour and eggs must be cooked to be safe to eat, you don't meekly comply, you FIX THE SYSTEM. Seems a matter of national security to me! Anyone who has tasted the difference that even simple pasteurization makes in food—milk, orange juice, cider—knows what heating does to flavor. I'm from upstate New York, and I know what cider is supposed to taste like. The pasteurized [fill in your own noun] available now doesn't deserve the name. I've said it before: I'm convinced that a good part of the obesity problem in America is that we are unconsciously searching for the FLAVOR that mass-produced, heavily-processed foods have lost. National security again. Don't get me wrong, however—I love cookies after they're baked, too. I'm a big fan of the Maillard Reaction as well as of raw food. Let the Little Children Come! I almost cried in church today. Instead, I fist-bumped Porter. We are learning more and more about our new rector. I don't expect always to be pleased with what we learn, but if I heard him right, today was huge on the plus side. He was talking about the Confirmation class he will be teaching, explaining that unlike some rectors he prefers to teach everyone together instead of separating children from adults. He went further. Families, he said, belong together in church. He reminded people that we have an alternative children's activity that families are welcome to take advantage of if they wish, but added that in his view the norm is for famlies to worship together and children are welcome in the service. He didn't explain any further—this was more of an aside during the announcements—but I very nearly broke my staid choir persona and shouted, "Amen!" It's a personal, as well as a philosophical, issue for us. It was a grandmother moment. I get to open the Advent calendar! It's my first and only composite! I find three things particularly notable in this exercise. My eclectic denominational experience has stood me in good stead. Knowing 85+% of the hymns on this list, I still find myself encountering a surprising number of completely unknown hymns when our grandchildren pick hymn numbers at random when we sing together. 91. What Child Is this? 47. And Can It Be That I Should Gain? I cannot resist a new Green Ember book, and while we are waiting for a continuation of the main series, S. D. Smith has provided an appetizer in the form of a sequel to the prequel. Of The Black Star of Kingston, I wrote, "It's a distant-past prequel to The Green Ember, and definitely enjoyable to read in its own right. It's not quite as satisfying, mainly because it's much shorter, but also because the strong female characters are mostly missing. Perhaps even rabbit civilizations need to develop over time." Much the same could be said about The Wreck and Rise of Whitson Mariner. As an appetizer, it is small, and lacks the depth and nuance of a full meal. It's also primarily about battles, the kind that tend to appeal more to a young, male audience. While reading, I couldn't help seeing a juvenile version of the car chases and gun battles in NCIS: Los Angeles. Or, if you prefer a more classical analogy, the battle descriptions in The Iliad. That aside, it's a fun story, and not lacking in the examples of courage, love, and sacrifice I've come to expect from S. D. Smith. Plus, even though the men get most of the action, the women get some exciting parts, too, and come out better than in the previous story—if not as well as in the later Green Ember books. I haven't made up my mind about anything yet. What holds me back the most is knowing I'd have to find a place to store a new appliance. Ideal for a small family up to six people. Revealing my age, I can say that I remember the days when a family of six was considered small; now our children's families (of six and eight) attract attention wherever they go. Back then we didn't have Presto fryers, nor frozen French fries: my mother made fries for our (small) family of six starting from whole potatoes, and using a pot of oil on the stove. And they were so good! As time went on, she did switch to using frozen French fries, which was definitely easier, though not better. Does anyone have thoughts about deep fryers to share? I'm interested—if I am interested; I'm still not sure—in something small, since our current household is small by any standards (two). I did not take the time to watch President Bush's funeral today, but now that I've seen the bulletin, I almost wish I had. I don't even like funerals. And unlike many of my friends, I've never longed to be invited to a Royal Wedding, even if I am (ahem!) related to the present Queen of England. I've never felt the need or desire to attend a service at our own Washington National Cathedral. Until now. In truth, what I really wish is that I could have been part of that service, because as I always say, "I don't do congregation well." Put me in the choir, and I'm happy. I imagine President Bush's funeral was like the biggest service I've ever been a part of, the consecration of our current bishop, Greg Brewer—only a few orders of magnitude grander. Check out the bulletin (it's a pdf). I'm practically drooling. Now I only need to find a spare 3.5 hours to watch it. 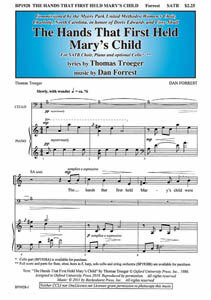 We're singing this lovely anthem for our Christmas Lessons & Carols service. The hands that first held Mary's child were hard from working wood. From boards they sawed and planed and filed and splinters they withstood. but cradled from the head to heel our Lord, newborn and frail. and like the host of stars that beamed blessed earth with welcome light. but God with us, Emmanuel, as close as blood and bone." and from his heart rose hymns and psalms for heaven's human word. and use with anger, fear, and pride to crucify God's gift. but charged with faith may we be bold to follow in His way. At first, I was a litte put off by the words. Questions of logic kept getting in the way. Did Joseph really have steel tools? I looked that one up, and he certainly could have; steel had been invented long before. But was it common enough for an impoverished carpenter in Palestine to be using steet tools? That I couldn't easily determine. Were Joseph's really the first hands to hold Jesus? This provoked quite a lot of comment from the women in our choir. We're talking more than 2000 years ago. Did men really act as midwives back then? I would guess only if absolutely necessary and they wouldn't have had a clue in any case. If Mary (wtih no experience) managed the birth herself, it's her hands that would have caught the baby. But how likely is it that in a very crowded Bethlehem there couldn't be found a midwife, or at least an experienced mother, to assist Mary when the birth pangs began? That a firstborn son should have been laid in the putative father's hands does not stretch the imagination, but that he was first? I'm skeptical. Fortunately, our choir director is patient, and we just kept practicing the anthem. Lo and behold, I started to find it very moving. I finally recognized it for what it is: not literal, but symbolic. Symbolic hymns were once a lot more common, and modern folks generally think they're weird, e.g. the Christmas carol, I Saw Three Ships. But they can be very powerful. I'm reminded of another, hauntingly beautiful, symbolic anthem that our children's choir sang many years ago. And many roses flourish'd there. To make a garland for His hair. He call'd the children in to share. Now that the roses are all dead?" Are left for Me, the Christ-child said. Sprang drops of blood like roses red.